As many of you know, my friend and singer of seminal goth band FLESH FOR LULU, Nick Marsh has been battling cancer. At one point he was in remission and was fighting hard to bring Flesh For Lulu back to the US for some shows. Being a huge fan of the band, and having been greatly inspired by them, I supported that effort and believe that we will still get to that goal in the end. But sometimes Life throws us all a curveball and we have to change the plan. Nick’s cancer has returned and he has just spent time in a London hospital getting the treatment he needs. He is the ultimate fighter and he is doing what he does best right now – fighting. But as a musician, he receives no sick pay and needs a little bit of help with the huge costs associated with battling this disease. Please CLICK HERE TO READ MORE ABOUT NICKS CANCER FUND. A friend of mine, Greg Hutting, who has actually bought paintings of mine (one of which helped the Flesh For Lulu fund) asked me if he could paint a portrait of me that we could perhaps sell to help Nick, and of course I said yes. But the end result is just so much better than I think either of us hoped. 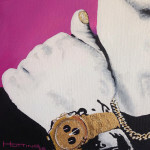 This unique, one-off painting is Acrylic and Gold Leaf on Canvas and is 16″ x 20″. I will be posting throughout the week about this but the person who bids the highest by midnight PST next Friday 17th April will win this painting. ALL of the money will be donated to the Marsh Family Cancer Fund. 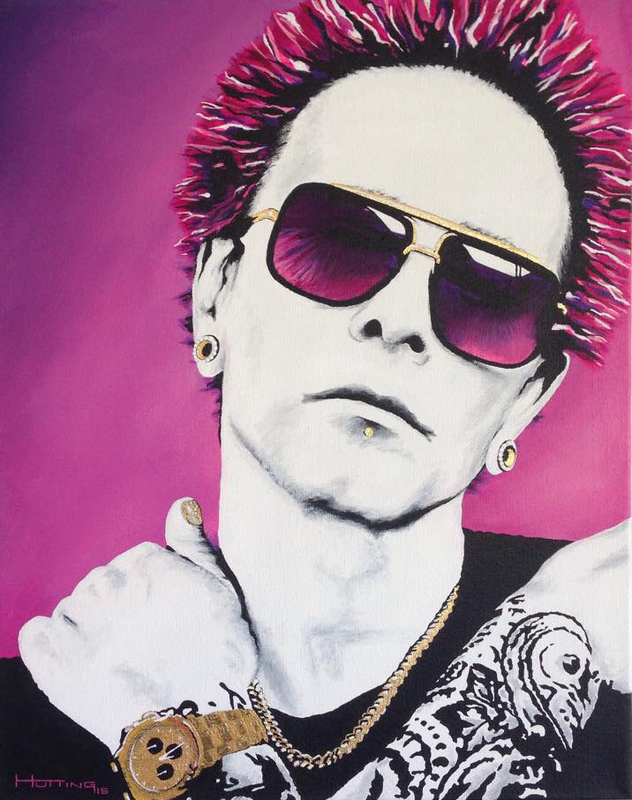 ANY and ALL bids HAVE to be emailed directly to me – info@billymorrisonart.com – and the winning bid needs to be paid via PAYPAL within 24 hours of the close of auction. All questions and requests for more info can be directed to me at the same email address. I’m stunned at how well this came out, and we have decided that along with the artist signature on the front, I will write a personal message on the back to the person who wins this auction. The painting will be shipped out to the winning bidder next weekend. And with that, I am going to open the bidding at $500. Do I hear $550?